• Nine bathing machines at Clifton Marine Baths. • North gallery of St. George’s Church added. • Act of Parliament authorised the building of the canal from Gravesend to Strood. • Gravesend auxiliary of the British & Foreign Bible Society founded. • Act of Parliament passed to re-align the road between Northfleet and Gravesend, to be named New Road. • “Roebuck” public house, Queen Street, burned down. Mr Slaney, pilot, of Deptford died in the fire. • Gun brigs “Mariner”, “Menox” and frigate “Medusa” (32guns) launched from Pitcher’s Dockyard. • First Sunday school opened in Princes Street Chapel. • Population of Gravesend and Milton 4,539. Population of Northfleet 1,910. • Robert Pocock established a library with a reading room at Gravesend. • A fire in the engine room stopped work on the Gravesend to Essex tunnel, but work was later resumed. • One hundred and twenty-three townspeople founded the United Society of Oddfellows. 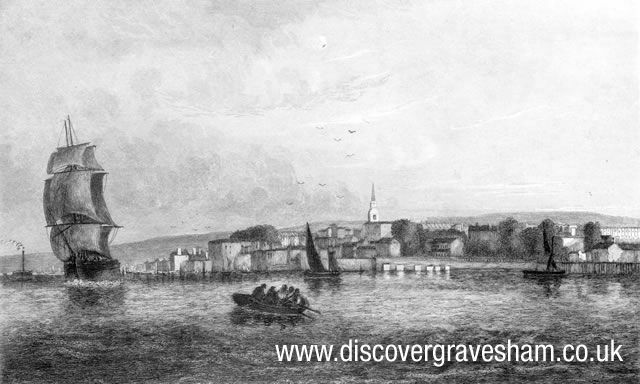 • John Constable (the artist) visited Gravesend and sketched a view of Chalk Church. • Mr. Pitcher leased twelve moorings in Northfleet Hope for use of ships in the service of the East India Company, from the Government for 31 years. • “Eagle” (74 guns) launched from Pitcher’s Dockyard. • A rowing match was set up by Captain Durand MP, between 6 watermen of London and 6 watermen of Gravesend, to row 67 miles from Gravesend to the Nore light and back to Rotherhithe. Large wagers were placed. The teams rowed in 6 oared boats named “Eclipse” and “Hector”. The crew of the “Hector” (London men) gave up before they reached the Nore. The “Eclipse” rowed the whole distance in 8 hours 17 minutes and so the Gravesend crew were adjudged the winners. • Artist J.M.W.Turner visited Gravesend and again in 1807, making various sketches of the area. • Subscription list opened for the relief of those wounded at the Battle of Trafalgar. • “Happy Britons” club founded to celebrate the victory at Trafalgar. • Augusta, Duchess of Brunswick (sister of George III) landed at Gravesend. • Milton churchyard with ground given by Colonel Dalton (Lord of the Manor) enclosed by a brick wall on the North and South sides. • Court of Commissioners (for the recovery of debts not exceeding £5) set up at Gravesend. • Gun brigs “Bruizer”, “Blazer”, “Cracker” and “Clinker” launched from Pitcher’s Dockyard, also “Cumberland” (74 guns). • Gun brig “Rolla” and the “Venerable” (74 guns) built at Pitcher’s Dockyard. • Milton Church bells re-hung and new treble bell supplied. • Work began on the lock to the canal basin. • Captain Samuel Godley, Royal Navy press gang commander, thanked by the Corporation and given Freedom of the Borough on his retirement for “promptness of his aid to civil power and zeal in public service”. • Work on the tunnel between Gravesend and Essex stopped. • “Egmont” (74 guns) launched from Pitcher’s Dockyard. • There were 26 sailing vessels (totalling 2,240 tons) operating between Gravesend and London. • Proposal to build large naval docks near Northfleet rejected on account of the cost. • Population of Gravesend and Milton 5,589. Population of Northfleet 2,031. • “Gloucester” & “Medway” (each 74 gun ships) launched at Pitcher’s Dockyard. • Frigates “Meander” and “Araxis” and brig “Alert” built at Pitcher’s Dockyard (last Government ships built). • Russian fleet refitted in Pitcher’s docks. • Thames frozen in January and the Rochester Road blocked by snow. • Louis XVIII, King of France, passed through Gravesend. • First regular service of pleasure steamers from London to Gravesend by “Margery” (70 tons) a vessel of the London & Margate Steamboat Company. • Customs House excise building erected on the site of the Old Fountain public house, which was rebuilt on the south side. • William Bradbery began to cultivate watercress at Springhead gardens. • A wave of spending on church furniture and fabrics to accommodate the growing resident population and the large influx of summer visitors. • Steamboat “Thames” (74 tons) in service from Gravesend to London. • A meeting of the inhabitants of Gravesend was held to set up a school for poor children in union with the National Society. A subscription was commenced and temporary rooms were hired. • A new system of telegraphy set-up, again using the site at Gad’s Hill - which was designed to pass messages from the Admiralty in London to the Dockyard in Chatham. • Committee appointed to consider state of the market and proposed for it to be enlarged. • Cobham Hall altered in Tudor style. • Steamboat “Sons of Commerce” (80 tons) in service from Gravesend to London. • Nathaniel Gyles, Searcher, died. • Savings Bank established in King Street and later transferred to High Street. Mr Thomas Caddel was the first Actuary. • The Corporation ordered improvements to the Town Hall and the first stone was laid in October of that year. • South gallery and two upper west galleries added to St. George’s Church. • Gallery and Altarpiece added to Milton Church. • The Searchers office was removed out of town. • Charles Dibdin, composer, dramatist, poet, novelist, actor, singer and entertainer, visited Gravesend and wrote a song about the town. • John Keats (poet) sailed from Gravesend on his way to Italy. • Work on the market improvements stopped through lack of funds.